Nothing makes me surer that spring is on its way than the arrival of a new spring yarn! TANGIER comes to us from Cascade, and we think you're going to love it! A worsted weight that knits up at a generous gauge of 16 - 18 stitches in four inches, Tangier is a beautiful, wool-free yarn. It's a brand new yarn, so be among the first to cast on a project with this silk, cotton, acrylic and rayon blend. We can't wait to see what you decide to make with Tangier. Need a little inspiration? 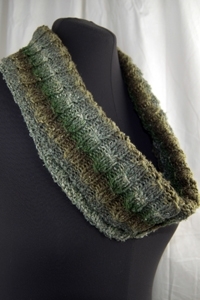 Cascade has a Free pattern for the 'Tangier Cowl' a pretty one knitting skein project.